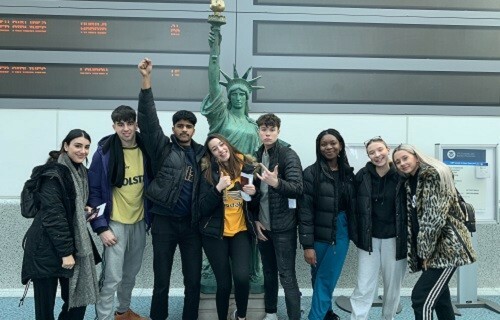 Mr Head, Mr Hussein, Ms Ablett and Ms Leader had the pleasure of taking a group of Sixth Form students to New York on the Performing Arts trip during the February half term. Mr Head, Mr Hussein, Ms Ablett and Ms Leader had the pleasure of taking a group of Sixth Form students to New York on the Performing Arts trip during the February half term. We had an amazing time with the students experiencing every aspect of the Big Apple. Below is an account from one of our students. On Friday 15 February, we began our journey to the city that never sleeps, New York. As soon as we touched down into the city, we were in awe of the towering skyscrapers and never ending roads. On our first night we explored the streets of Times Square with amazement, as the bright lights shone, and ate a delicious meal at Planet Hollywood. The next day, we enjoyed the high line walk and the sites from Brooklyn Bridge, followed by visiting the 911 Memorial. In the evening we went up the Rockefeller Centre, taking in the magnificent view of the New York skyline at night. On Sunday 17 we visited Central Park and 5th Avenue, later followed by a Stage Combat Workshop and watched Waitress on Broadway. On Monday we visited the Empire State building in the morning, with a backstage tour of the Radio City Hall. That evening was by far the most memorable as we enjoyed a meal at Ellen’s Diner, a singing restaurant, feeling the buzz of the singing waiters, we decided to sing through Times Square as we made our journey back to the hotel. Having onlookers cheer and join in with us, created a memory which shall never be forgotten. Sadly, departure day arrived, with one last visit to the Statue of Liberty. Even though, we ran out of time and did not make it onto the Ellis Island, we still had the most wonderful experience of New York. The trip was filled with much laughter and collectively we are all very thankful for the teachers who helped make our experience the best it could be. Maria 12 Walbrook.